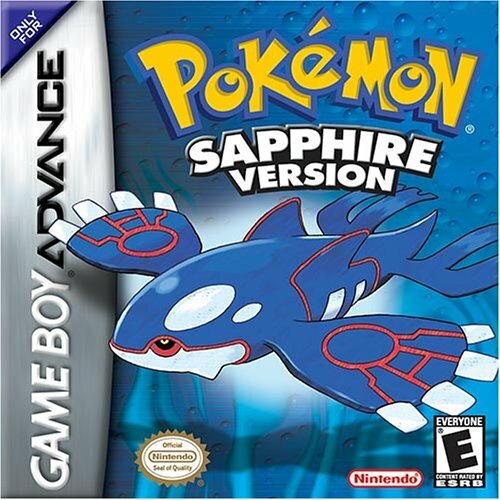 In Sapphire, you start out as a pokemon trainer eager to catch pokemon (little cute monster things). But your task will not be easy. There is a gang called Team Aqua, and you must stop them from their sinister plans. So what\'s the difference between the old pokemon games and this one? Most of the old pokemon have been replaced by new ones. The amount of pokemon in the game raises from 150, to 200. So there are more pokemon to master. Instead of stoping Team Rocket from reeking havoc, you\'ll be taking on Team Aqua, who are trying to raise the ocean\'s water level to create more habitats for pokemon and people. You won\'t be battling them alone though, Team Magma will be there to help you. Have ever wanted to show off your pokemon that you\'ve captured? Now you can with the Pokemon Contests! Winning a contest depends upon how well the crowd likes your pokemon, and how well you can impress the judge with your moves. Winning a battle depends on strategy and strength. If your pokemon is a higher level than the pokemon you\'re facing, you have an advantage. Also, the type of pokemon you\'re fighting with makes a huge factor. For instance: If you fight with an electric pokemon, and your opponent has a water type, the water type will be wiped out. Also, some attacks are more powerful than others. Some attacks have special abillities. You can paralyze your opponent, making him unable to move, or you can poisen your opponent so that each turn he loses a little health. You can freeze, burn, and put your opponent to sleep. Also, there are attacks that can fuss with the opponents stats, such as lowering his defence or accuracy. One more thing that can drive your opponent nuts. Lets say he has you down to little health. He thinks he has you, then you use a potion, and boost yourself back to full health. Then you beat the pants off him! There are eight gym leaders; each use a certain type of pokemon. They get increasingly harder as you go along. There are two main things that people will find either offensive, or they will have no problem with it at all. First is evolution. When your pokemon get to a certain level, they evolve, making them more powerful and unlocking new attacks. Secondly, there are phsycic pokemon, who use their minds to attack you.